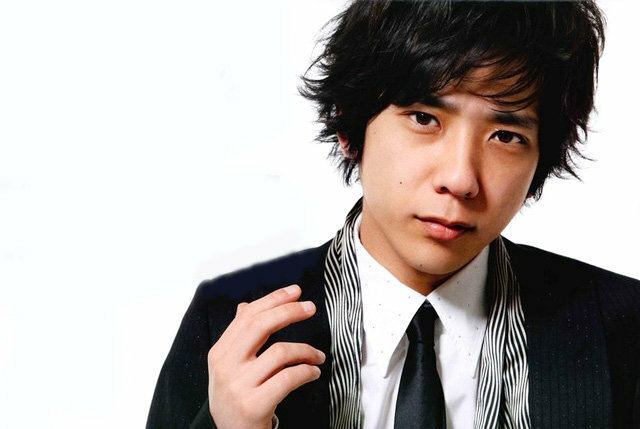 Kazunari Ninomiya (二宮 和也 Ninomiya Kazunari) (born June 17, 1983), often called Nino (ニノ), is a Japanese idol, singer, songwriter, actor, seiyū and radio host. He is a member of Japanese boy band Arashi and is best known to movie audiences for his portrayal as Private Saigo in the 2006 Clint Eastwood war film Letters from Iwo Jima. Ninomiya began his career in the entertainment industry when he joined the Japanese talent agency Johnny & Associates in 1996 at the age of 13. Prior to his debut as a singer with Arashi in 1999, Ninomiya started an acting career when he was cast as Chris for the stage play Stand by Me, which was based on the film of the same name. Since then, he has went on to appear in numerous drama, movie and stage productions, making him known as the actor of Arashi. Described as an actor who can act with his mouth and eyes, Ninomiya has won a number of awards and nominations for his roles. Ninomiya was born in Katsushika, Tokyo as the youngest child of his family. His father and mother were both working as chefs when they met and his sister is two year older than him. His parents divorced early in his life and his father left the family soon after. When Ninomiya was born, his grandfather immediately came home and named him the heir to the family’s windshield factory since he was his grandfather’s only grandson. However, when Ninomiya was twelve years old, his cousin sent in an application to Johnny & Associates without his knowledge. After attending and passing the auditions due to his mother’s bribery, he joined the talent agency. Ninomiya graduated from high school in March 2002 at the age of 18. For music-related releases and activities with Arashi, please see Arashi. In 2004, Ninomiya penned and composed “Kako” (痕跡 The Past) for his solo performance during Arashi’s Iza, Now!! tour. Although Arashi’s fifth studio album One was the first of their albums to feature solo songs of each member, Ninomiya did not provide lyrics or music for official release until the Time album almost two years later. In 2007, the group’s eighteenth single “Love So Sweet” was released with the limited edition containing the bonus song “Fight Song” (ファイトソング Faito Songu), which was written by Arashi and composed by Ninomiya in 2006 for their variety show G no Arashi. On July 11, 2007, the Time album was released with the limited edition containing solo song of each member. Ninomiya wrote the lyrics to his solo song, “Niji” (虹 Rainbow), and played the piano portion of the song throughout Arashi’s summer tour. He later reprised the performance throughout Arashi’s second Asia Tour in 2008. In 2008, Ninomiya composed, co-arranged and penned the lyrics for his latest solo “Gimmick Game”, which took on a different style compared to his past solos. Ninomiya also wrote Arashi’s 10th Anniversary song, 5×10, with Sakurai Sho, also a fellow member. Ninomiya wrote the lyrics while Sakurai wrote the rap. Ninomiya began his acting career in a 1997 stage play based on the American coming of age film Stand by Me with future bandmates Masaki Aiba and Jun Matsumoto. He did not return to do any major stage productions for nearly seven years after Stand by Me, instead focusing on dramas. However, in 2004, Ninomiya appeared in his first lead role in the stage play Shibuya Kara Tooku Hanarete (シブヤから遠く離れて). From April 3, 2005 to May 4, 2005, he took up Rebel Without a Cause, playing the James Dean character Jim Stark. From July 18, 2009 to August 11, 2009, Ninomiya appeared in his first stage play in four years. He starred as the psychopathic murderer Bruno in Mishiranu Jōkyaku (見知らぬ乗客 Strangers on a Train), which was based on the novel of the same name. In 1998, he made his television debut as a fifteen-year-old runaway in the TBS television movie Amagi Goe (天城越え Crossing Mt. Amagi). Just a few months before his debut with Arashi, he was given his first lead role in the drama Abunai Hōkago (あぶない放課後 Dangerous After School) with Subaru Shibutani acting as his stepbrother. His schedule became packed, causing him to lose 7 kg in a month as a result. From October 11, 1999 to October 29, 1999, because Arashi were the main supporters for the 8th World Cup of Volleyball Championships, all five members co-starred together for the first time in the volleyball-centered short drama V no Arashi (Vの嵐). In 2006, Ninomiya starred in the drama special Sukoshi wa, Ongaeshi ga Dekitakana (少しは、恩返しができたかな Have I Returned a Bit of My Gratitude), which was based on the true story of young man named diagnosed with Ewing’s sarcoma. He went on to appear in two different films for the rest of 2006 before taking up Haikei, Chichiue-sama (拝啓、父上様 Dear Father) on January 11, 2007. During the summer of 2007, he and fellow Arashi bandmate Sho Sakurai co-starred together in the manga-based comedy drama Yamada Tarō Monogatari. Ninomiya played the title character Tarō Yamada (山田太郎 Yamada Tarō), an extremely poor student attending a school for the rich. Soon after—whilst juggling rehearsals for Arashi’s upcoming concerts—he acted as the lead in the drama special Marathon (マラソン Marason), which was based on the true story of an autistic young man training to become a marathon runner. After a year without any acting roles, other than a small guest appearance in bandmate Satoshi Ohno’s first lead drama Maō, Ninomiya finally took up the main role in the drama Ryūsei no Kizuna with Ryo Nishikido and Erika Toda acting as his younger siblings. The three played the children of parents who were murdered long ago by an nameless man. Readers, reporters and critics of the 59th Television Drama Academy Awards panel recognized his role as the oldest vengeful sibling and awarded him Best Actor. His Ryūsei no Kizuna role also earned him an Outstanding Actor nomination in the drama category in the 49th Monte-Carlo Television Festival. In spring 2009, Ninomiya starred as the lead in the third and final of the TBS kandō (感動?, “moving”) drama special trilogy Door to Door, with the first and second being Sukoshi wa, Ongaeshi ga Dekitakana and Marathon respectively. The drama special was based on the true story of Bill Porter, an American door-to-door salesman who achieved the highest sales for his company despite suffering from cerebral palsy. His roles in Door to Door and Ryūsei no Kizuna won him the Individual Award in the television category of the 46th Galaxy Awards, a first for a Johnny’s talent and the first by an actor in his twenties. Ninomiya began filming for the drama special Tengoku de Kimi ni Aetara (天国で君に逢えたら If I Can Meet You in Heaven) in April 2009. However, the special, which saw Ninomiya’s first time playing a psychiatrist, did not air on television until September 24, 2009. In January 2010, Ninomiya co-starred with the other members of Arashi in their first drama in nearly ten years in the human suspense drama special Saigo no Yakusoku (最後の約束 Last Promise). Ninomiya portrayed Shuuji Yamagiwa (山際修司 Yamagiwa Shuuji), a 27-year-old temporary security center employee who is caught up in a building hijack. In 2002, he made his motion picture debut in Arashi’s first movie together, Pikanchi Life Is Hard Dakedo Happy (ピカ☆ンチ Life is HardだけどHappy Pikanchi Life is Hard But Happy).Ninomiya next took to the screen as Shuichi, a high school student trying to get rid of his abusive stepfather, in the 2003 film Ao no Honō with Aya Matsuura as his co-star. In 2004, Arashi came together again to reprise their respective roles for the sequel of Pikanchi Life Is Hard Dakedo Happy, Pikanchi Life Is Hard Dakara Happy (ピカ☆☆ンチ Life is HardだからHappy Pikanchi Life is Hard Therefore Happy). 2006 proved to be a productive year for Ninomiya as he became the first artist from Johnny’s & Associates to debut in Hollywood. He played a reluctant soldier called Saigo in Clint Eastwood’s Academy Award-nominated Letters from Iwo Jima with Academy Award-nominated actor Ken Watanabe. His performance was praised by many film critics, some of which include RogerEbert.com editor Jim Emerson (“thoroughly winning”), Claudia Puig of USA Today (“also superb”), James Berardinelli (“another performer worth singling out”) and Kirk Honeycutt of The Hollywood Reporter (“who is just terrific”). On January 7, 2007, New York Times film critic A. O. Scott listed Ninomiya as an ideal Oscar candidate for Best Supporting Actor. On October 24, 2006, a couple months after returning from filming Letters from Iwo Jima in the United States, he debuted as a seiyū, lending his voice to main character Black in the Michael Arias animated film Tekkon Kinkreet. In 2007, all the members of Arashi co-starred in their third movie together, Kiiroi Namida (黄色い涙 Yellow Tears), with Ninomiya playing the main role of an aspiring manga artist. On October 8, 2009, it was announced that Ninomiya is set to star in the two live-action adaptations of the manga Gantz. He will star as Kei Kurono, a young man who is hit by a subway train and becomes part of a semi-posthumous “game” with other deceased people. With Kenichi Matsuyama as his co-star, part one and two of the Gantz movies are expected to open in theaters in the winter and spring of 2011 respectively. Months later, on December 23, 2009, it was announced that Ninomiya will star in another movie slated to open in theaters in Japan on October 1, 2010. With Kou Shibasaki as his co-star, Ninomiya will play Hiroyuki Mizuno (水野祐之進 Mizuno Hiroyuki), a young man living in a matriarchal society due to a disease that killed most of the male population, in the live-action adaptation of Fumi Yoshinaga’s award-winning Ōoku: The Inner Chambers manga. Ninomiya has his own radio show, Bay Storm, since October 4, 2002. The show is currently airing every Sunday on Japan’s BayFM, in which he often plays his own renditions of Arashi’s songs as well as songs by other artists.